Over my years living here in Spain for some curious reason the Guardia Civil’s path and mine seem to cross quite frequently. Please don’t misunderstand me when I say this. I am not a hardened escaped bank robber from the East End of London or a drug baron with Balkan connections on the run. On the contrary I am a law abiding (occasional parking or speeding ticket) citizen. However, somehow I have had some quite interesting brushes with the law. Most of these so called “brushes” can be summed up as bizarre. Today I am going to tell you about one of the stranger ones. Please excuse the length of it but I havent been able to reduce it to a short version. It all started when I went fishing one sunny autumn morning. 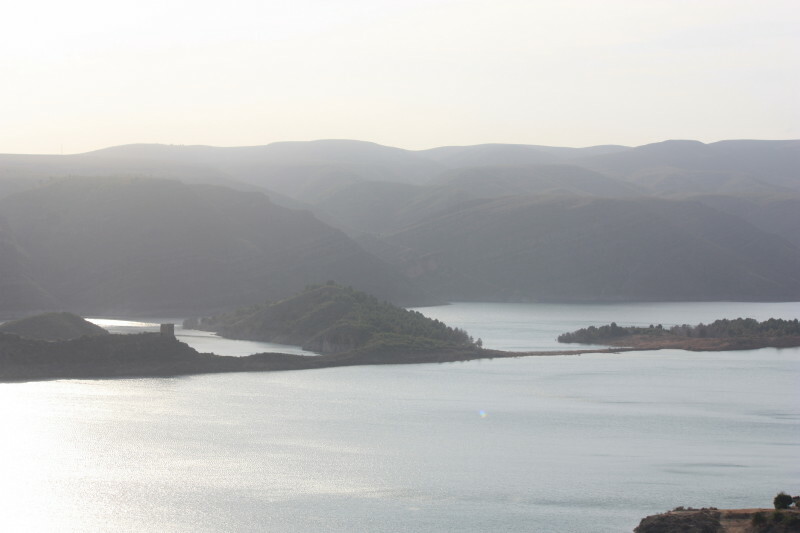 I had gone to fish in a very lonely and isolated place,called Tous Reservoir, and I went to an area which you can only get to by walking a long way through gullies and over mountains. I left the car at the end of the road(it is a dead end) , next to the lake which is a large artificial lake formed by the dammed river Jucar.This car park is in itself lonely . I then hiked maybe over an hour to a place from where I used to walk back fishing from. I was spinning/lure fishing which is a type of fishing which involves moving around and means you can and should move from one place to another a lot. And literally, as I made my first cast I saw what looked like a dirty old deflated plastic football lying in the dried mud(the reservoir had recently receded and gone down in level since I was last there). The dirty deflated ball was slightly too solid when I kicked it and it rolled over a couple of times and as I watched it rolling, it dawned on me that it was no football but a human skull!!!! Excuse the pun, but I literally stopped dead in my tracks……….OooooH! Looking around I suddenly realized that there were bones(definitely human) scattered all over the area of about twenty square metres. I checked where I was. Basically near(about 100 metres from) an old abandoned hut/farm. As I had no coverage on my phone and the bones weren’t going anywhwere I decided to continue fishing, wondering sporadically where the bones came from.Were they the remains of some Civil War murder squad, a cemetery or some poor victim of a pyscho killer? I eventually got home 5 hours later and called the Guardia Civil to report the find. “No need for you to come back to the reservoir, Sr.Waller,we know the area well” I was told. “Yes but the bones are in a very isolated place. Past the…” The duty Guardia Civil interrupted,”If we need your help we will call you”. And they did a couple of hours later.They could not find the bones and could I take them to the place. So I met up with two agents from the local cop shop. One the sergeant was overweight,looked overworked, and very serious and the other was young thin and smiled a lot,the rookie.I duly spent four hours with the Laurel and Hardy of the men in green(Guardia Civil).Nice enough guys but in no way were they CSI investigators! ”And you come out here on your own?”,the sergeant(the large one) asked increduously. As we walk and as we start to arrive at the ‘bone spot’ a series of worries flashed through my mind.What if they weren’t human bones? Would I be done for wasting their time? And if they were human maybe they would treat me as a suspect?! This thought made me feel pretty uncomfortable being in a foreign country and being from a country with its fair share of pycho killers! Wow! I thought,not many rigid crime scene rules followed here.Between the Mercadona bag and the three of us trampling over the area and the bones picked up and dumped in a black bin bag it all seemd a little lackadaisical. Still we made our way back as I said it was getting dark and if we didn’t hurry we wouldn’t make it back in daylight and the mountain paths were dangerous enough not to have to negotiate them in the dark! Fortunately as we started walking back we saw a small dinghy motoring by which the Guardia Civil hailed to come over.You should have seen the look on the guys’ faces.They thought they were being pulled over to have their fishing and boat licenses checked(and they almost certainly didn’t have everything in order from the look on their faces!) But we just piled into the boat with the black bin bag and the Mercadona bag.The guys in the boat were intrigued about who I was as I was in civvies but I just chatted to them about fishing.One of them could contain his curiousity no longer.”So are you a Guardia Civil?” I had to laugh “Me? No, I am a fisherman like you.” How on earth could he have thought a guiri(foreigner/Brit) with a guiri accent was a policeman. Maybe now somewhere in Spain there is at least one English Guardia Civil,(although it’s unlikely) but this was about 17 years ago and the idea was highly unlikely! I could see the fishermen were puzzled as to what I was doing with two Guardia Civil, a Mercadona bag and a black bin bag,which they continuously glanced at furtively. Anyway, still intrigued,the fishermen dropped us off near our car. We clambered out of the boat and as they all stood there the sergeant said to them,lifting up the bin bag,”I suppose you want to know what this is all about? Well this gentleman here found some human remains up at the other end of the lake and we have been up there to get some samples.Thanks so much for your help.” I noticed the two fishermen look at me with a look which seemed like a mixture of suspicion,horror and fear. I felt distinctly uncomfortable and very like a suspect in a bad detective B movie. Back at the station the police made me fill out a form and said they would be in touch once the bones had been analysed.Jesus! Would they come knocking on my door for further questioning! When I told my workmates about the story a couple of them said that I shouldn’t have reported the find. What if the Guardia Civil had killed a couple of ETA terrorists and dumped them there 10 years before. Or what if it was a Civil War related mass grave and the Guardia Civil were in some way involved. You might have stirred up a real hornets nest. I should be more careful about what I report. Amazing!That was so comforting of them! The Guardia Civil never called me. So I thought it was nothing….but my wife said let’s call and find out.So she did and they said that the bones were well over a hundred years old and were most likely from the nearby abandoned hut/farm which was too far from the nearest village to take their dead there so they had buried them there near the buildings and the modern reservoir had uncovered their makedo cemetery. I must say it was a relief to hear the news but then I thought, what if………….. 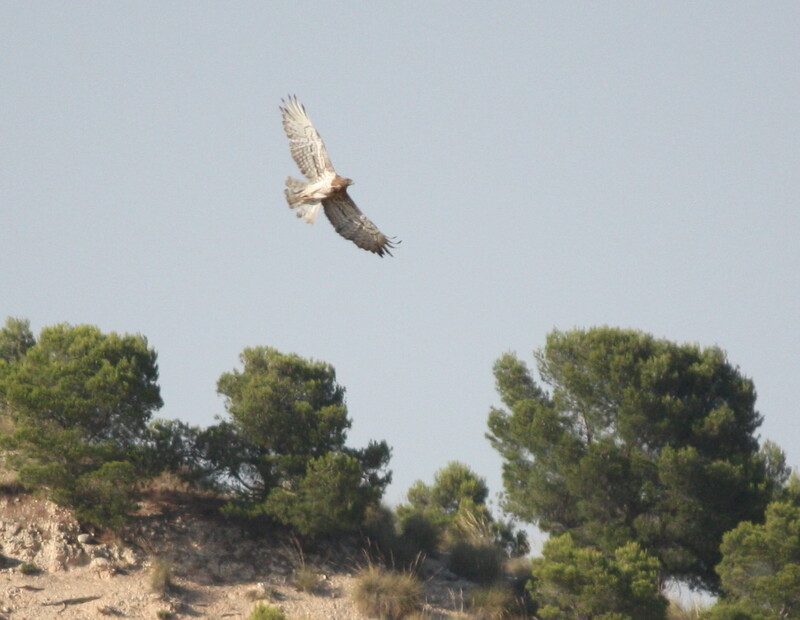 This entry was posted in Guardia Civil, Lakes, Valencia, walking and tagged birds of prey, fishing, Guardia Civil, Lakes, Laurel and Hardy, Spain, Valencia, walking by Paddy Waller. Bookmark the permalink. Ha! Fantastic post. Good to see the Laurel and Hardy crack team were carrying Mercadona bags about. Would have hated to have seen them having to waste another few centimos paying for another to put the bones in. Haha!The dynamic duo and their placky bag—thnaks for the comment and RT Will! Great story Paddy, only just read it – 8 months later…..and congrats for going thought with the reporting, revisiting and re-telling. Its not always easy when you are own your own and away from the centre of town. It reminds me when I found a woman hanging by the neck from a tree a few years back. It took me a while to figure out what to do as it seemed too bizarre to be real. Strangely, in almost the smae spot a few years later, I found (what I thought) was a childs burnt hand buried under a tree stump. That too took some will power to stride back into town and report that one. So well done for reporting it and well done for telling it. Im sure a a few of us that go stumbling around off the beaten tracks will have stores, if prompted to tell. Thanks Paul for your comments.These kinds of situations are never easy and certainly at the time it was not so funny as it could have been more gruesome/tragic.In hindsight the situation was a lot funnier. Whoops, misspelled my email address on that last post. Oh well, thats not important. Great story Paddy. This could only happen in Spain!